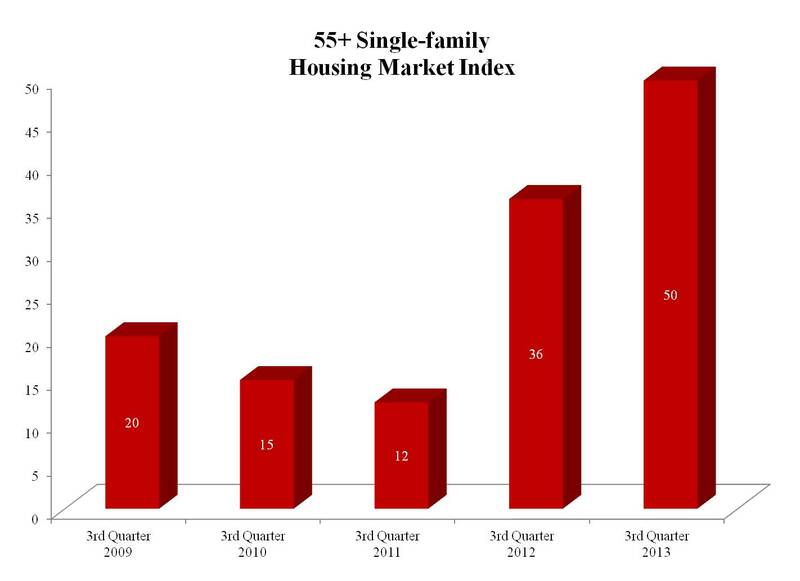 Compared to the first quarter of 2013, the single-family index increased 4 points to a level of 50, which is the highest first-quarter reading since the inception of the index in 2008 and the 10th consecutive quarter of year over year improvements. There are many factors contributing to the positive signs in the 55+ housing market, including rising house prices and low interest rates are helping baby boomers sell their existing homes at a favorable price and in turn, purchase a new home more suited to the current lifestyle. Three of the four 55+ multifamily rental indices showed slight declines in the first quarter. Present production dipped one point to 42, expected future production decreased three points to 45 and current demand for existing units dropped one point to 55. Future demand showed an increase of one point to 59. Builder confidence in the 55+ housing market for the fourth quarter of 2013 is up sharply, according to the National Association of Home Builders’ (NAHB) latest 55+ Housing Market Index (HMI). All segments of the market—single-family homes, condominiums and multifamily rental—registered strong increases compared to the same quarter a year ago. The single-family index increased 20 points to a level of 48, which is the highest fourth-quarter reading since the inception of the index in 2008 and the ninth consecutive quarter of year over year improvements. The 20 point year-over-year increase in 55+ HMI for single-family homes matches earlier gains in the NAHB/Wells Fargo HMI for the overall single-family market and surpasses the more recent gains in the other housing segments. Builder confidence in the 55+ housing market showed continued improvement in the third quarter of 2013 compared to the same period a year ago, according to the National Association of Home Builders’ latest 55+ Housing Market Index (HMI). All segments of the market, single-family homes, condominiums and multifamily rentals, registered strong increases. The single-family index increased 14 points to a level of 50, which is the highest third-quarter number since the inception of the index in 2008 and the eighth consecutive quarter of year over year improvements. All of the components of the 55+ single-family HMI showed considerable growth from a year ago: present sales climbed 16 points to 52, expected sales for the next six months rose 11 points to 53 and traffic of prospective buyers increased 10 points to 43. The 55+ multifamily condo HMI posted a gain of 14 points to 37, which is the highest third-quarter reading since the inception of the index. All 55+ multifamily condo HMI components increased compared to a year ago as present sales increased 15 points to 37, expected sales for the next six months climbed 11 points to 40 and traffic of prospective buyers rose 13 points to 35. The 55+ multifamily rental indices also showed strong gains in the third quarter as present production increased 17 points to 48, expected future production rose 15 points to 50, current demand for existing units climbed 18 points to 60 and future demand increased 16 points to 60. The positive year over year increase in confidence by builders for the 55+ market is tracking along with other segments of the home building industry. The 55+ market is improving in part because consumers are more likely to be able to sell their current homes, which allows them to buy a new home or move into an apartment that suits their specific needs. Builder confidence in the 55+ housing market improved the fourth quarter of 2012 compared to the same period a year ago, according to NAHB’s latest 55+ Housing Market Indices (55+ HMIs). There are separate 55+ HMIs for two segments of the 55+ housing market: single-family homes and multifamily condominiums. Each 55+ HMI is based on a survey that asks if market conditions are good, fair or poor. An index number below 50 indicates that more builders view conditions as poor than good. Although both 55+ HMIs remain below 50, both have improved significantly from a year ago. The single-family index increased 10 points to a level of 28, the fifth consecutive quarter of year over year improvements. Although multifamily condos remain the weakest segment of the 55+ housing market, the 55+HMI for condos also showed a substantial year-over-year increase, of six points to 19. Meanwhile, the 55+ multifamily rental indices, which had already recovered substantially in 2011, remained relatively stable in the fourth quarter, although there was a slight pullback due to uncertainty about the low-income housing tax credit—the financial driver behind a significant portion of apartments built for this segment of the market. Present production dropped three points to 31, expected future production dipped one point to 34, current demand for existing units dropped four points to 38 and expected future demand fell five points to 39. Like the overall housing market, the 55+ segment of the market is undergoing a slow but steady recovery, but there are some obstacles to a continued and stronger recovery. While problems with tight credit conditions for buyers and obtaining accurate appraisals are still lingering, new problems like spot shortages and rising costs for labor, materials and lots are beginning to emerge. Once again, builder confidence in the 55+ housing market showed significant improvement, according to NAHB’s 55+ Housing Market Indices (55+ HMIs) for the third quarter of 2012. The 55+ HMIs and their components are based on survey questions that ask builders if market conditions are good, fair, or poor (high/very high, about average, or low/very low for the questions on traffic). The indices all lie on a scale of 0 to 100, where 50 is a break-even point that occurs when equal numbers of builders report good and bad conditions. 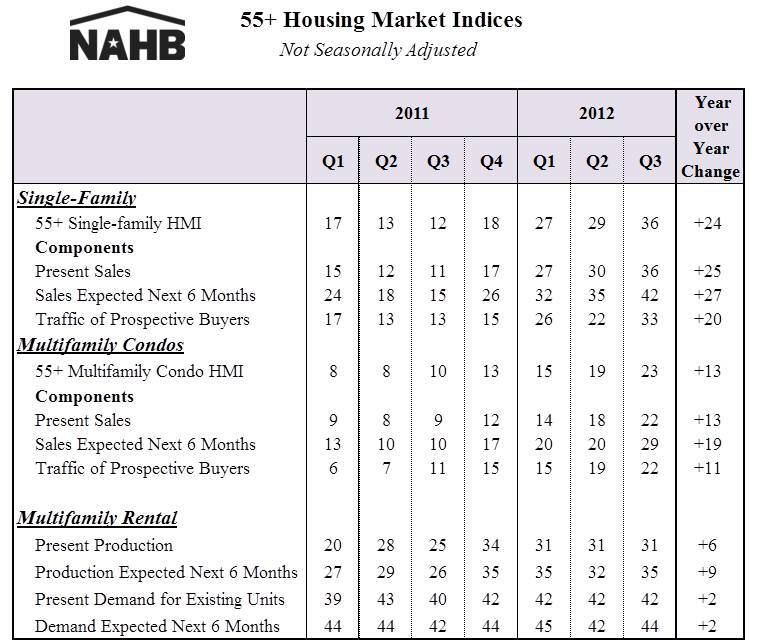 Although multifamily condos remain the weakest part of the 55+ HMI, builder confidence improved there as well. The 55+ HMI for condos had a significant increase of 13 points to 23, which is the highest third-quarter reading since the inception of the index in 2008. Meanwhile, the 55+ multifamily rental indices, which already recovered substantially last year, showed continued but more modest increases in the third quarter. For example, present production climbed six points to 31. Like other segments of the housing market, the market for 55+ housing is improving steadily as conditions get better in some parts of the country. Although all 55+ HMIs are improving, all still remain below the break-even point of 50, indicating that there are still many places where builders consider the market for 55+ housing to be only fair to poor. So, at the national level, there is considerable room for further improvement, assuming that the housing recovery can expand into other parts of the country.